The recipe says to serve warm or at room temperature – I have only ever had these potatoes warm, so can’t vouch for their yumminess at room temperature. Heat the oven to 200c. Line a baking sheet with parchment paper, and set aside. 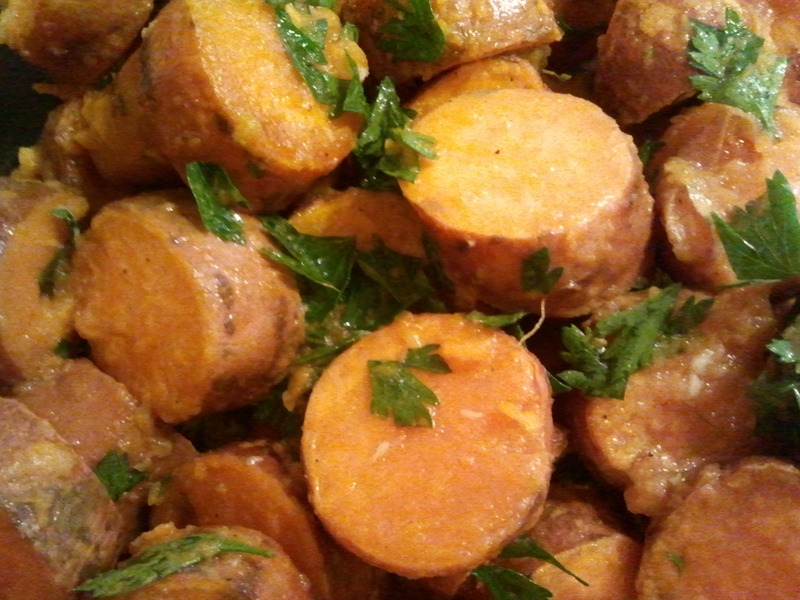 Place the sweet potatoes in a medium bowl, toss with 30mL of the oil, and season to taste with salt and pepper. Spread the potatoes on the prepared baking sheet, and roast until they can be pierced easily with a knife but still offer some resistance, about 30mins. Let cool for 15mins or so. Transfer the potatoes to a large bowl, and toss with the garlic, lime juice, parsley, and remaining 30mL of oil. Adjust the seasoning to taste with salt and pepper. Serve warm or at room temperature.